Please take note the office will be CLOSED Friday, May 25th thru Monday, May 28th for a long Memorial Day weekend. 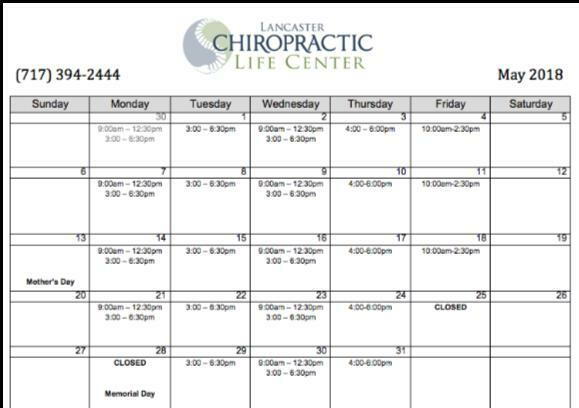 Also, don’t forget we have started our summer hours. We will be here Mondays through Friday for the summertime. The only changes are that we will be here Thursdays instead of Saturdays in the summer. The Journal of Alternative and Complementary Medicine published a study on December 20, 2017, showing that pregnant women who were under chiropractic care experienced an improvement in their quality of life. Even though chiropractic is a separate form of non-medical care, it is many times classified as CAM, according to the health community and governmental authorities. Other forms of healthcare known as CAM are supplements, meditation, acupuncture, massage, and yoga. A scientific questionnaire was given to patients of participating chiropractors. The criteria for the study was to be at least 18 years old and pregnant during the study. The study results were determined by 343 participating pregnant women who met this criteria. The average age of the women was 30.96 years. The educational level of the women showed a high level of education in the group with 31% having completed two years of college, 44% obtained a four-year baccalaureate degree, and 20% had a masters degree. On average, the women presented themselves for chiropractic care in their 25th week of pregnancy. The breakdown was 13.1% in their 1st trimester, 32.9% in their 2nd, and 53.9% in their 3rd trimester of pregnancy. The results of the study showed significant improvement in quality of life issues for the pregnant women for physical functioning, sleep disturbance, social roles, pain interference, and fatigue. The overview of the study given by the authors was, “The purpose of this study was to understand the characteristics and reasons why women seek chiropractic care and to test whether the changes in quality of life observed after starting chiropractic care were greater than the changes they would expect based on chance alone.” The study concluded that the women were highly satisfied with their chiropractic care, and reported that their quality of life measures had statistically improved. •Put on sunscreen with sun protective factor (SPF) 15 or higher with Ultraviolet A and Ultraviolet B (UVA and UVB) protection. Reapply after swimming and excessive sweating. I highly recommend chemical free sunscreens, as some chemicals generate free radicals, which can cause skin damage. •Seek shade at times and consider wearing a wide brimmed hat. •Cover up with clothing and sunglasses. •Avoid using tanning beds and sunlamps. •Put on insect repellent. I again recommend non-chemical repellents, such as eucalyptus, lemongrass, tea tree and peppermint. Some interesting facts about Memorial Day! •“Memorial Day” did not become the holiday’s official name until 1967, when federal law declared it. •Memorial Day was first observed on May 30, 1868. •Memorial Day was originally created to honor Union soldiers who’d died while fighting in the Civil War. Because of this, southern states did not observe Memorial Day until after World War I, when the holiday expanded to include soldiers from all wars. •In 1968, Memorial Day was moved from its traditional May 30th date to the last Monday in May in order to ensure a three-day weekend. Happy Memorial Day to you, and thank you to all the troops that have sacrificed for us!